HALIFAX, N.S., Feb. 18 – The famous ghost of Antigonish county today had won the second round of its fight with Agnostics and entered upon its third. First, it drove Alex McDonald from his farm in Caledonia Mills in midwinter, with a tale of mysterious fires and cattle that apparently had been stricken by a supernatural hand. Last night it sent Detective “Peachie” McDonald of the provincial police and Harold Whidden, a reporter, back to Halifax, satisfied by their investigation that the ghost exists and had slapped them. Today the cross hockey club, of Antigonish, which is here for a game with Dalhousie, announced that two of its members had been selected to wage war against the spook by continuing the investigation of the haunted house, which has had all Nova Scotia agog. So certain is Mr. Whidden of his conclusions, he offered to give $100 to the first person who can prove that supernatural causes are not responsible for the uncanny happenings at the McDonald homestead. Auburn, July 31 - One evening nearly a week ago the young son of Michael O'Hara put his head out of the window of his father's house in lower State street and allowed his eyes to wander across the street into the field of waving grain owned by ex-Mayor Mortimer V. Austin. Suddenly O'Hara gave a blood-curdling yell, and his face blanched as he saw rising from the center of the oat field a strange apparition. It was apparently the figure of a man clothed entirely in white. The ghostly figure stalked across the oat field, swinging a lantern in its hand. It advanced to the fence facing the road, and after flourishing his lantern up and down several times like a brakeman signaling a railroad train, the white figure gave a tremendous bound into the air and vanished from sight. The youth managed to gain strength enough to crawl back into bed. The next morning he told the story of the specter to his parents, who in turn told it to the neighbors, and the neighbors gave it to the local newspapers, and the news was heralded far and wide. The next evening 500 or more people congregated in the highway in front of the O'Hara residence and waited for the apparition to appear. The board fence in front of the oat field was lined with spectators. About 10 o'clock the ghost appeared, carrying his lantern with him. The specter made its appearance, apparently rising from the ground at the foot of a beech tree which stands at the west end of the field. The white-robed figure dodged in and out, seen at one minute, the next lost to sight. After continuing this performance for a few minutes, the figure advanced boldly toward the astounded spectators. It came on with a bounding movement, similar to that made by a kangaroo while in motion. When within a few feet of the spectators, the ghost stood motionless for a second, and after waving the lantern in the air three or four times, suddenly vanished from sight. This is the way a young man of unquestioned veracity tells it. The next night an attempt was made to capture his ghostship. Thirteen (an unlucky number) of Auburn's bravest young men took up their position among the branches of the beech tree, from under which the ghost appears. The young sentinels were not afraid of ghosts. Oh, no! and they chuckled to themselves, thinking of what fun they would have in the capture. About 300 or 400 people stood in the street. The ghost appeared about 10 o'clock. It arose as usual from the ground at the foot of the beech tree. Its appearance caused an unusual commotion among the brave young men in the tree. One of the would-be captors fainted, while his companions clutched more tightly the branches of the tree and with awe-stricken faces waited for the thing to pass on. His ghostship did not carry his lantern on this occasion. The following night another and more determined party of men attempted to capture the ghostly visitant. They chased it around the oat field, but could not capture it. Just as one of the pursuers would attempt to place a hand upon the spectre it would suddenly vanish, only to reappear again a second later in a distant part of the field. It is a motley crowd which gathers nightly to catch a glimpse of his ghostship. Some times it appears and then again it doesn't. It is a very uncertain ghost to gamble on. Old, gray-haired men, as well as barefooted, rosy-cheeked children, gather in front of the oat field and keep nightly vigils, waiting for the apparition to appear. Young men and their sweethearts make the scene a trysting place, and they come on foot and on bicycles to wait and watch. Parents even bring their children out to see the ghost. The fences on both sides of the street have been torn down by the mob, and the oat field is stamped down, as if a herd of Western steers had passed over it. It has been roughly estimated that fully 4,000 people have visited the field during the week. The scene where the alleged ghost appears is inside the city limits, yet the authorities have taken no action in regard to the matter. Chief of Police MacMaster is waiting for the property owners of that section to enter complaint. There are no city ordinances which prohibit orderly and respectable ghosts from taking up their abode in an oat field or anywhere else. In fact the framers of the city's by-laws neglected to enact ordinances under which a ghost could be apprehended and punished for his temerity in stalking abroad at night with a lantern in its hand. 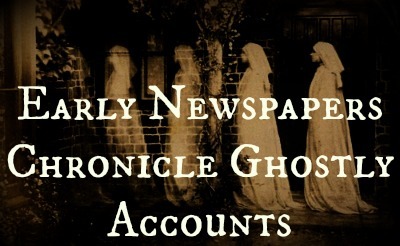 There are many theories as to the identity of the ghostly phenomenon. Some claim that it is the spirit of a restless bicycle rider who was electrocuted during the dark ages for not having his lamp lighted after sundown. That during the revival of the bicycle craze in modern times he is doomed for a certain number of nights to appear with his lantern as a warning to those wicked riders who will persist in letting their lamps blow out on dark and stormy nights. Some say that it is the spirit of a man who was murdered in the oat field many years ago. The criminal records of the county fail to show when the alleged murder was committed, or who was the victim, consequently that story will not hold. A man named Murphy, residing in State street in the vicinity of the haunted field, says that the specter is the Murphy family's cat. Thomas is a beautiful white feline, who occasionally rambles away from home to meet his enamorita in the haunted field. The theory, however, is not credited by those who have seen the specter, which has been described to be from six to ten feet tall. As Murphy's cat never was, or never will be, ten feet in height the probabilities are that Thomas is not the guilty party. The O'Haras don't know who or what it is, and what's more, don't like to talk about the matter for publication. One of the neighbors said that the specter is a young girl who resides in York street. The young girl in question indignantly denies the accusation and says that if she ever catches her accuser face to face she will scratch his eyes out. This at once establishes her innocence. Officer Titus, who patrols the State street beat, says that the ghost is a man with a white sheet over his head. Officer Titus started out to investigate the matter a few days ago and to find out if possible who the joker might be. In less than forty-eight hours he was told by as many as fifty of the residents who the guilty party was. Strange to say, every one of the fifty informers were in turn accused by each other of the heinous offense and here the matter rests. The specter appeared again about 11:15 o'clock to-night and nearly frightened the wits out of a large number of spectators by its grotesque actions. The figure apparently dropped from the clouds into the midst of a crowd of young men, who were seated under the beech tree smoking cigarettes. The smokers dropped their cigarettes and with a screech fled from the field with the strange apparition in hot pursuit. The phantom chased the men into the middle of the street, and then, with a peculiar bounding gait, returned to the field and then vanished from sight. BEVERLY, N.J. March 18 – Bridgeboro, the home of witchlore and ghost scares, had another sensation, which the residents take seriously, and after each nightfall the streets are deserted. Joe Johnson and a party of friends, passing what is known as the Paxson Pits a few nights ago, were confronted by a dwarf which they declared climbed out of a pit. For a minute it lingered and then, giving a piercing screech, vanished into the woods. Other witnesses, farmers of unquestionable veracity, substantiate Johnson’s story. The old residents say that years ago a reserved man, who lived on the outskirts of the village, and whose name never was learned, as the family would not mingle with the villagers, had a deformed son. The man was driving along the country road, when the carriage was supposed to have overturned and the child fell into the pit and broke his neck. The version of the accident was accepted, but wild rumors were afloat at the time. Those who have seen the specter describe it as a boy whose head seems to hang limp upon his chest. Carbondale, Pa. March 19 - The ghost of John Kinnie has visited his wife’s bedroom twice within a week, and she fears it may be the cause of her death. Each time the phantom visitor choked her, and her neck is said to have black and blue marks caused by long thin fingers. Kinnie died a year ago. Just as the clock tolled midnight last Monday, Mrs. Kinnie says, she heard the front door open. Then there were footsteps in the hall. She hastily locked her bedroom door and listened in fright. A few minutes later her neck was encircled by a hand. She swooned, and when morning came was found on the floor in a dead faint. The same thing happened Wednesday night. The only explanation the doctor can offer is that Mrs. Kennie choked herself while sleeping. She is in a serious condition.